If you saw Pinky today, walking through Central Park in New York City with Jennifer Gillett, you might assume she was always a much pampered Chihuahua. But it isn’t so. 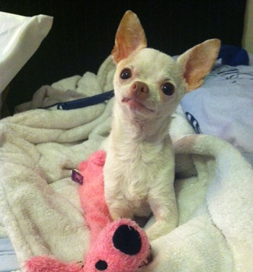 When Jennifer first laid eyes upon her on Petfinder, the dog was in a foster home. She had come to it suffering from anemia because of a flea infestation. She was emaciated, and all of her teeth were abscessed. But beneath all of her problems was a sweet little dog who deserved better. Read the story in Jennifer’s words. Agape Fosters, an animal welfare organization in Reinbeck, IA, placed her in the foster home, where she got the care and medical treatment she needed to regain her health. Then it was their task to find the perfect placement for her. Jennifer contacted them, and emails flew back and forth. She filled out an application and was approved to be Pinky’s new “mom. “It was love at first sight,” Jennifer says. “Her days of hardship were over and her new life full of love, adventure and happiness was about to begin. She goes on to say that watching a pet blossom is a gift beyond compare for the adopter and one the pet will never forget.